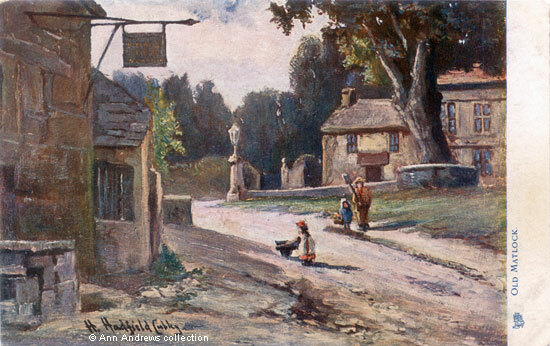 This postcard of Matlock Town, designated Old Matlock by the artist, is from a painting by Henry Hadfield Cubley. It is difficult to provide an exact date; whilst it is likely to have been painted in the first decade of the 20th century it is possible that Cubley painted this scene in the last part of the nineteenth century. The webmistress believes that he included his wife and two little girls to add something extra to the picture. Here is the area near St. Giles' parish church, which is off picture on the right, at the bend in Church Street. Behind the lamp is the entrance to the late eighteenth century Rectory. The Wheatsheaf (Wheatsheaf Farm) is the very old building behind the ancient tree. According to Pevsner's architectural guide, it dates from 1681 and has "a symmetrical front with windows of mullion-and-transome-crosses". Pevsner also commented that "no one can feel the nearness of modern Matlock here". This is still true today, despite the increased use of the motor car. Church Street was part of the old road connecting Matlock and Cromford and there were several inns along the route. The sign belongs to the old King's Head. There used to be a biography of the artist on this page. Ralph Tuck & Sons "Oilette" [Regd.] Postcard 1705. Not used, so no date. Pevsner, Nikolaus (1953) "The Buildings of England, Derbyshire" Penguin Books London, Melbourne, Baltimore, p. 179.